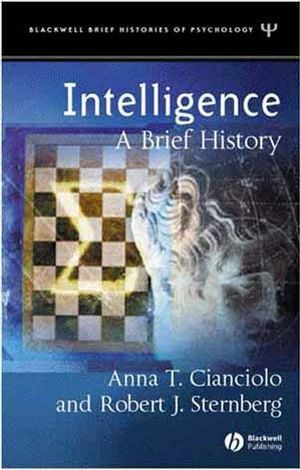 Intelligence: A Brief History is a lively and accessible look at the origins of the field of intelligence. The book explores the nature and measurement of intelligence, examines approaches to teaching intelligence, and discusses individual and group differences in intelligence. Readers will receive an historical overview of the field as well as a good understanding of its major ideas. Anna T. Cianciolo is the Senior Research Scientist at Global Information Systems Technology, Inc. in Champaign, IL and a former postdoctoral associate in the PACE Center at Yale University. Her current research focuses on individual differences in intellectual capability and their role in knowledge acquisition and the development of skilled performance. Robert J. Sternberg is Dean of the School of Arts and Sciences at Tufts University and Director of the Center for the Psychology of Abilities, Competencies, and Expertise. He was the 2003 President of the American Psychological Association and is an internationally recognized authority in the field of intelligence and creativity and the author of over 1,000 journal articles, book chapters, and books. Chapter 1. The Nature of Intelligence. Chapter 2. The Measurement of Intelligence. Chapter 3. The Teaching of Intelligence. Chapter 4. The Genetic and Environmental Bases of Intelligence. Chapter 5. Group Differences in Intelligence.